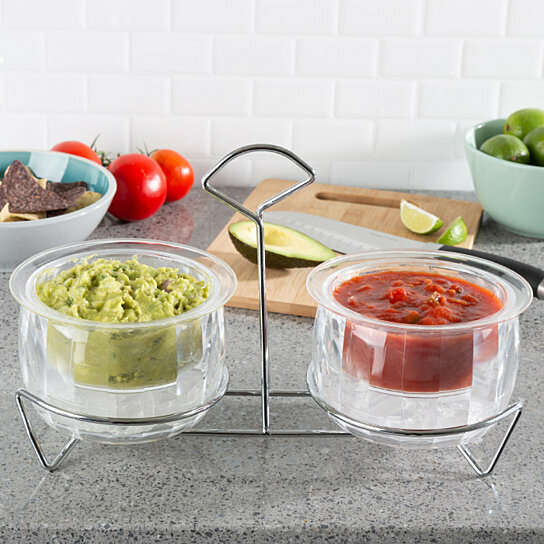 KEEP DIP CHILLED- The bowls have a cooling chamber underneath for ice to keep dips cold, fresh and safe; keep drink garnishes, dips, dressings, salsa, guacamole or any other chilled condiments at the perfect temperature during your event. BPA-FREE AND STURDY- The cold serving bowls are shatter-resistant and BPA-free, making them a safe and long-lasting option to use for parties and events for years to come. The bowls are also refrigerator and top rack dishwasher safe. CARRYING STAND INCLUDED- The set comes with 2 separate bowls to keep different dips separate, and an attractive metal holder for them. The crystal-clear chiller bowls are an excellent serving set for a bar, buffet, or party table. INDOOR OR OUTDOOR USE- Great for both indoors or outdoors, this stylish and practical 3-piece serving set is a must have for your next barbecue, baby shower, graduation, or birthday party! PRODUCT DETAILS- Material: Plastic. Dimensions: (L)13.5" (W)5.75" (H)8.25. Each of the 2 bowls holds up to 16 ounces. Certified FDA food safe and top rack dishwasher safe. Wash before first use.